Worked with his father on railway construction on the Continent. Supervised design and construction of permanent-way, bridges and rolling stock for the Swedish Central Railway and the Oxelösund Fleu Railway. 1878 Presumably moved to Engine and Boiler Insurance Co when his uncle established the company. Chief mechanical engineer of the company for fifty years. During that time he carried out research on the improvement of steam engine efficiency. Mr. Michael Longridge, C.B.E., who died at Exeter on Wednesday, at the age of 80, was a distinguished engineer. 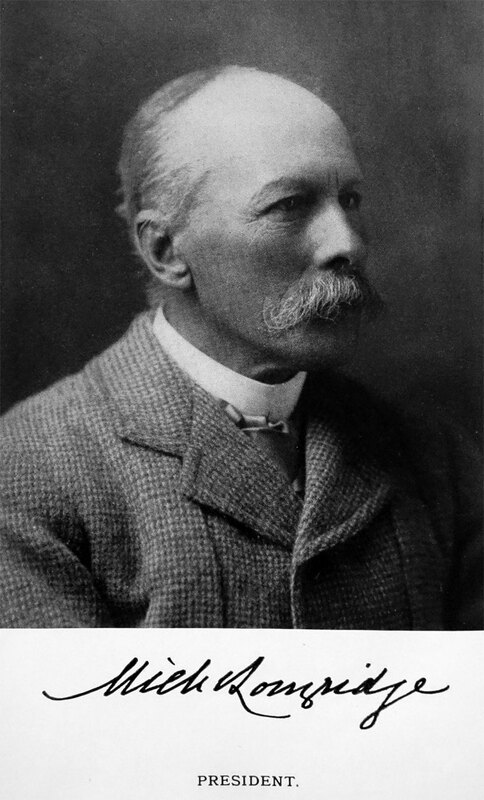 The eldest son of James Atkinson Longridge, M. Inst. C. E., who was a pupil of George Stephenson, he was sent in 1859 to Radley College, where he was a Richards Gold Medallist, and Ouseley prizeman in music. Going up to Trinity College, Cambridge, he graduated in 1869 among the senior optimes in the Mathematical Tripos. For the next five years, he was engaged in his father's railway undertakings, and in 1875 went to Manchester as assistant engineer of the Boiler Insurance and Steam Power Company, of which his uncle, the late Mr. R. B. Longridge, was chief engineer and manager. In 1878, when a new company was formed under the title of the Engine and Boiler Insurance Company, he became chief engineer. In this capacity the experience which Mr. Longridge gained in dealing with engines of every type brought him into prominence as a consulting engineer. The publication of the results of his tests in t5he long series of annual reports to the directors of his company helped to bring about a revolution in the ideas relating to the efficiency of steam engines. In 1903 Mr Longridge became a member of the Council of the Institution of Mechanical Engineers, and in 1917 he was elected president. In 1911 he was elected president of the Manchester Association of Engineers. In 1915 he was appointed to the panel of experts for examining inventions connected with munitions of war. He was also on the Engineering Standards Committee, the general board of the National Physical Laboratory, the Artificial Limbs Department of the Ministry of Pensions, and the Advisory Council of the South Kensington Museum. For his services he was made a C.B.E. He was elected to the council of his old school in 1918. In 1871 Mr. Longridge married Georgina Frederica Nepean, eldest daughter of the Rev. Owen Lucas O’Neill and by her had four sons and four daughters. She died in 1917 following the loss of two of her sons in the War. 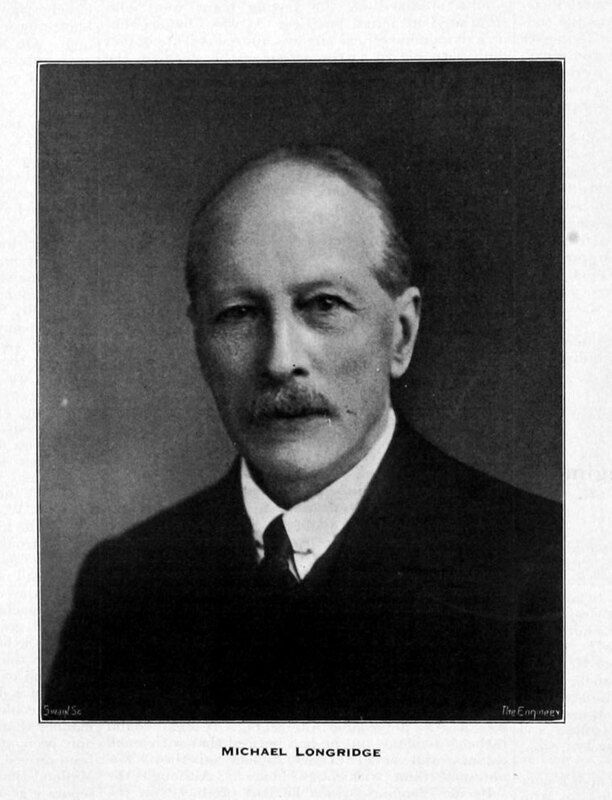 MICHAEL LONGRIDGE, C.B.E., President of the Institution in 1917 and 1918, was for fifty years chief engineer of the British Engine, Boiler and Electrical Insurance Company, and during that time carried out tests and made reports of such far-reaching importance as to render much of the improvement in the efficiency of the steam-engine as a prime-mover attributable to him. He came of a family of eminent engineers and was educated at Hadley College, and Trinity College, Cambridge, where he greatly distinguished himself in mathematics. He subsequently worked with his father on railway location and construction on the Continent and he superintended the design and construction of permanent-way material, bridges, and rolling stock for the Swedish Central Railway and the Oxelosund Fleu Railway. Besides visiting France, Italy, and Sweden in connexion with railway, canal, and irrigation engineering, he made a journey to Hungary to report on various works. In 1875, at the age of 28 years, he joined his uncle in what was then known as the Boiler Insurance and Steam Power Company and three years later commenced in earnest his work in connexion with the insurance against breakdown of steam-engines. Mr. Longridge was elected a Member of the Institution in 1880 and became a Member of Council in 1903. In 1911 he was made Vice-President, and in 1914 he took the place, at very short notice, of the President, Sir Frederick Donaldson, at the Paris Meeting of the Institution, Sir Frederick being prevented at the last moment from attending on account of industrial trouble at Woolwich Arsenal. Mr. Longridge's own period of Presidency occurred during the War and his services to the Institution in that difficult time were of special value, and represented a greater devotion to the interests of the Institution in that he was already under a great stress of responsibility in connexion with his own war work, for which he received the C.B.E. Mr. Longridge served on the British Engineering Standards Committee, the General Board of the National Physical Laboratory, and the Advisory Council of the South Kensington Science Museum. He was also a Member of the Institution of Civil Engineers. His death occurred at Exeter on 18th January 1928. This page was last edited on 5 July 2016, at 14:31.